But the best way to show your love and respect for Thailand’s favorite guy is to wear PINK! Everyone wears pink. Men and women. And men drive pink mopeds! So all you proud guys who are too macho to rock the pink can finally break down and show your true colors! Now you don’t have to go around sporting an entire ‘color of the day’ outfit. Most people don’t, but they do have something small to represent it. Sometimes a belt, tie, handkerchief, etc. When I get to, I’ll wear a shirt or skirt of the color. You will find yellow to be a really popular color here though. Mostly mustard or sunshine yellow. The king’s color is truly yellow because that was the day he was born on (monday). But with recent political uprisings, colors are starting to have new meanings. The pro-king colors are yellow, and the not-so-pleased-with-things people wear red. The king is recently associated with pink because he had some health issues and came out of the hospital wearing a pink blazer. This initiated a new fashion trend for pink to support the king’s health. People associate their ‘lucky’ color with their day of birth (weekday). I was born on a monday so I share the color Yellow with the AMAZING King as my Thai Lucky color. If you’re British its took-took, if you’re American it’s tuck-tuck if you’re Thai, it’s tuk-tuk and you pay less! A tuk tuk is a tiny truck that is a cheap ‘taxi.’ It looks like a tiny version of a moving truck with the back as benches to sit on. You can get them easily any time during the day. They tend to be scarce after 10pm. If you are ferang (white) and coming off a boat or bus, they will try to charge you 100B (which is only $3)..but that’s B.S. Before you get here, learn how to count and don’t let them charge you more than 20B (“Yee Sip Baht”). Even that is a bit pricey but work with what you can. 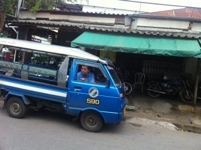 If they still try to charge you too much, walk a block or two and grab a tuktuk there. TukTuks have their own schedule. If you are on one with other people, don’t expect to get to where you’re going first. And you’ll see the locals paying no more than 10B. The longest tuktuk ride i took unintentionally was a 30min ride around town when all I needed was to go about 7 min drive. It was only 15B but it took up my lunch hour. Anyway, TukTuks are the way to go if you don’t have a car or bicycle. But if you use them to get everywhere, it’ll start to be costly. If you are here for a while, I recommend a bicycle or motorbike. I personally have a bicycle and love it. I’ll post a picture of a TukTuk when I remember to take on.